The goal of the project is to cater to the needs of schools and other educational institutions. Skolelinux is highly scalable enabling it to be used in versatile environments, from a small network to a large cluster. Skolelinux is ready for institutions ranging from small primary schools up to universities with several hundred computers. Web-browsers, office suites, teaching tools, various programming environments and a lot more is already included. We utilise the latest Debian release (Etch) and with it the KDE suite for the default desktop. Skolelinux is collecting free software for education. We also working on the liberation of unfree software for teaching. The talk will give an overview about the status and what skolelinux and KDE should aim together. Kurt Gramlich (born 1952) studied Sociology at the University of Freiburg and Bielefeld. After his graduation he studied management of energy and ecology at the University of Technology in Berlin. In 1983 he became a teacher at the VHS Ravensberg (adult education program) near Bielefeld where he is now the coordinator of courses about all fields of computer technology and ecological sciences. 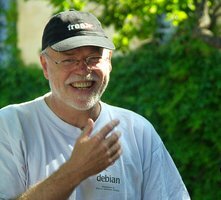 In 1997 he founded the Linux User Group Ravensberg. In 2002 he joined Skolelinux, bringing many ideas of other school servers into the project. He attended the Debian conference in Oslo 2003 and has held several talks about Skolelinux since then. In 2003 he founded a test center for Skolelinux in Guetersloh. Kurt's goals with Skolelinux are to create a highly scalable school server based on Free Software for educational purposes and available in all languages. In his spare time Kurt enjoys surfing with snowboards, playing the alto sax, being on vacation with his four children and having a lot of fun with good Free Software.